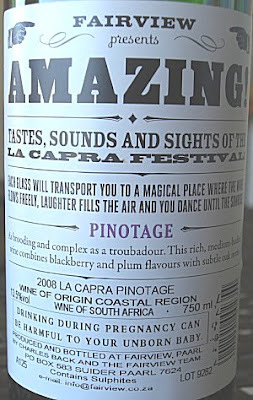 I was reminded of the Beatles tune ‘Being for the Benefit of Mr Kite’ when I opened La Capra 2008 Pinotage. The fab four’s song had been inspired by a circus poster, as surely is La Capra. The ranges’ back labels promising that “each glass will transport you to a magical place where the wine flows freely, laughter fills the air and you dance until the sunrise” recall Victorian fairground posters. La Capra seems a strange name for a new wine brand until you learn that it’s a Latin reference to goats and then you understand. For behind La Capra stands someone who George Taber in his recent book ‘In Search of Bacchus’ calls “a man who never heard a pun about goats he didn’t like”. Yup, it’s Charles Back; chief goat herder, cheese maker extraordinaire, wine maker, tracker down of old blocks of rare grape varieties and consummate marketer whose brands include Fairview, Goats du Roam, Spice Route and who has interests in MAN Vintners, Juno and more. Da Capra labels’ claim that ‘Fairview presents AMAZING tastes, sounds and sights of the La Capra Festival’ will come true, says Anita Streicher, manager at Fairview Winery’s master tasting room. She tells me that Fairview will be hosting an annual live La Capra fair with stalls, jugglers, fire eaters and other circus and fairground entertainments, and no doubt plentiful wines and goats’ cheese to accompany them. La Capra is meant to be an easy drinking, non-serious, fun wine range. Individual pricing is not yet announced but for an indication currently any six wines from the nine strong range are available at Fairview for 200 rands (£16.50/$33). The La Capra range includes a Malbec, still an uncommon variety in the Cape and the wine which Anita recommends, as well as Sauvignon and Chenin Blanc, Chardonnay, Viognier, Merlot, Shiraz and Cabernet Sauvignon. So what of La Capra Pinotage 2008? It is said to be ‘as brooding and complex as a troubadour’, but I am not up to date on the psychology of travelling balladeers. I found it to be a clean, modern, fruity wine for drinking, which is what I did with it. It went down quickly and enjoyably -- but it didn’t sing to me. Harpers reports that Spier are "pulling out of supermarkets in favour of a push in the on-trade and independent merchants", but they do not mention whether this affects the many own-label wines Spier produce for UK supermarkets, for instance the ASDA Pinotage 'wine of year' praised by Tim Atkin, see here. Kanonkop Estate’s popular red blend Kadette will soon have a pink partner. The rosé Kadette will be made from Pinotage. 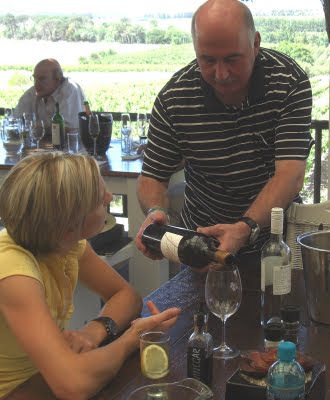 For some years Kanonkop has concentrated on just four wines; as well as Kadette there is varietal Cabernet Sauvignon and Pinotage and the Paul Sauer Bordeaux blend. 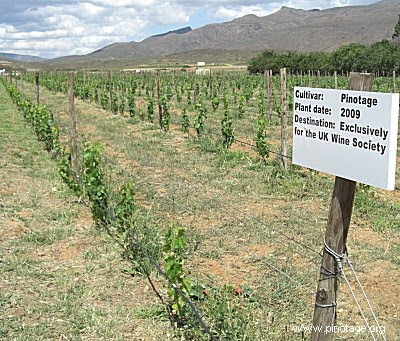 For some years The Wine Society, the world’s oldest wine society, has sourced their own label Pinotage from organic wine farm Bon Cap in the Eilanda valley near Robertson. 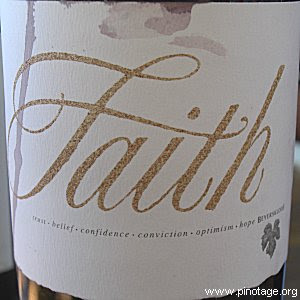 In order to meet growing demand and showing their faith in the variety they have contracted Bon Cap to plant a Pinotage vineyard exclusively for their own wines. The Wine Society is a UK based non-profit making mutual society owned by its members which operates primarily via mail order and the internet. The International Wine & Spirit Competition’s Trophy for Pinotage has been saved by the swift intervention of the Pinotage Association when KWV withdrew their 13 years sponsorship at short notice. The Pinotage Association, with the backing of their sponsors ABSA, immediately stepped in to ensure that Pinotage continues as a Trophy category. The Trophy has been renamed the Abraham Perold Trophy for Best Pinotage to give recognition to the father of Pinotage, Abraham Perold. KWV, who hold the rights to the Abraham Perold brand name, graciously consented to the re-naming of the Trophy. “We believe that this will enable a more collective drive in honouring the legacy of both Pinotage and Perold internationally”, said KWV CEO, Thys Loubser. The IWSC is one of the world’s biggest and most authoritative wine competitions and South Africa’s own grape variety, Pinotage, was introduced as a category in this competition in 1995. 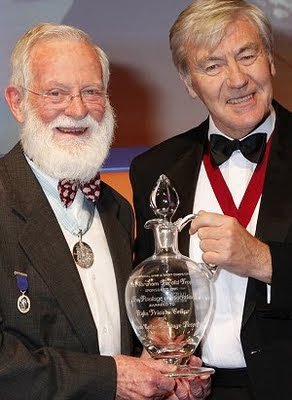 This year the 2009 Abraham Perold Trophy was awarded to Rijk’s Private Cellar for their Pinotage Reserve 2006. He says "At Restaurant Petrus I usually use this wine in a blind tasting and most of the guests think that it originates from the Rhone Valley." While Brian Freedman - WineChateau.com's resident blogger at UnCorkLife.com finds Wildekrans' 2006 Pinotage reminded him "in a lot of ways, of some sort of cousin to a Leoville-Barton, though it never lost its own identity. Just gorgeous." As he says "Unfortunately, too many people still aren’t familiar enough with Pinotage. But it’s a grape worth exploring. You never know when you’ll find a standout...or two."